The world energy market is undergoing a historic shift. A dramatic drop in oil prices, an ongoing conflict and unrest in major oil producers, shale oil production propelling the US as an oil exporter and the historic US-China agreement on climate change, to name but a few. These events are contributing to a new world order with serious consequences for energy producing and consuming nations. 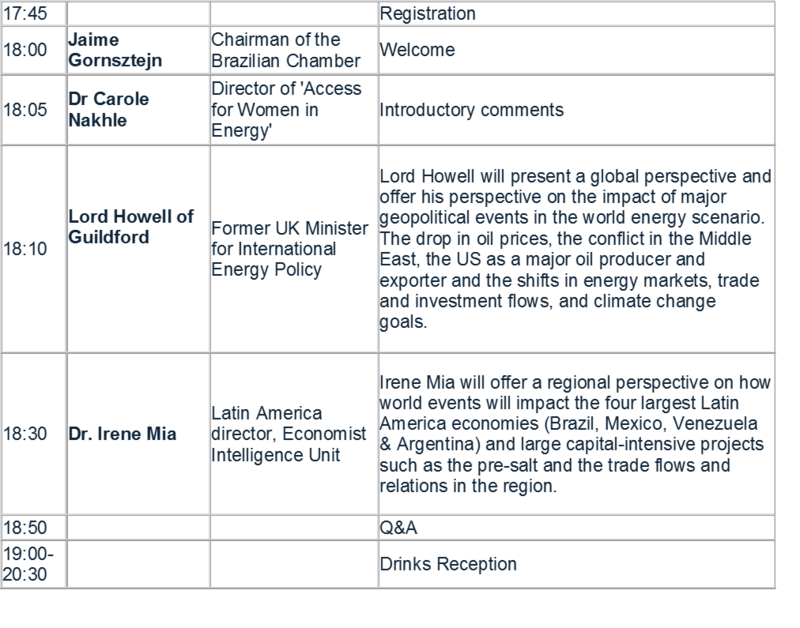 Lord Howell of Guildford and Dr Irene Mia will share their views on the new energy geopolitics, the shifts in energy markets, trade and investment flows, and climate change goals as well as the consequences for the largest economies in Latin America. Dr Carole Nakhle will moderate the discussion. The event will be followed by a networking reception. Lord Howell of Guildford served under Margaret Thatcher as her first Energy Secretary and has held numerous Government and public posts since – including a term as Foreign and Commonwealth Minister in the 2010 Coalition Government. He Lord Howell was for ten years the Chair of the House of Commons Foreign Affairs Committee and one of the chief architects of UK-Japan relations. He was awarded the Order of the Sacred Treasure by the Emperor of Japan in 2002. He is the Chairman of Crystol Energy Advisory Board, President of the UK Energy Industries Council, Chair of the Windsor Energy Group, and author of several books, including Out of the Energy Labyrinth – jointly with Dr. Nakhle – in 2007. He is also President of the Royal Commonwealth Society and actively engaged with the Commonwealth network’s 53 country membership on energy and trade issues. He advises Mitsubishi Electric, the Kuwait Investment Office and Japan Central Railway Ltd. – among other companies. Dr Carole Nakhle is the Director of UK based Crystol Energy. She has more than 17 years of experience in energy economics. She worked in the oil and gas industry (Eni and Statoil), policy making (Special Parliamentary Advisor in the House of Lords, UK), academia (University of Surrey), and as a consultant to the IMF, World Bank and Commonwealth Secretariat. She is a Research Fellow at the Lebanese Centre for Policy Studies and a Scholar at the Carnegie Middle East Centre. Dr Nakhle has published two books and numerous articles and writes for academic journals as well as newspapers and magazines. As an energy expert, she is a regular contributor to the Geopolitical Information Service (Liechtenstein). She lectures, among others at the Graduate School of International and Development Studies in Geneva, and is a sought after commentator on energy and geopolitics in the press and on TV. Dr Nakhle is the Founder and Director of the non-for-profit organisation “Access for Women in Energy”. Dr Irene Mia is regional director for Latin America and the Caribbean at the Economist Intelligence Unit (EIU). In her role, she provides intellectual and strategic leadership to the regional editorial team within the EIU’s Country Analysis division, fostering intellectual debate and publishing high quality reports and articles on economic, political and business developments within the region. Previously, she was director and senior Economist within the Centre for Global Competitiveness and Performance at the World Economic Forum. She has written and spoken extensively on issues related to national competitiveness and development, serving as lead author and editor on a number of regional and topical competitiveness papers and reports; notably, she was the editor of the Global Information Technology Report series for six year, one of the flagship publications of the World Economic Forum. Before joining the World Economic Forum, she worked at the headquarters of Sudameris Bank in Paris for a number of years, holding various positions in the international affairs and international trade divisions. Her main research interests are in the fields of development, international trade, economic integration, innovation, ICT, competitiveness, cities and Latin America. Irene holds an MA in Latin American Studies from the Institute for the Studies of the Americas, London University, and a PhD in International Economic and Trade Law from L. Bocconi.